Nuts and seeds are some of the most nutrient dense and delicious foods on earth. They are an important part of fertility nutrition, pregnancy nutrition, and beyond, because they supply the body with ample fiber, protein, minerals and essential fatty acids. Proteins are required for building and repair of the body’s tissues in general, and baby-making in particular. The amino acids that make up protein are the building blocks of the body’s cells, and is also an excellent source of energy. You’ll need to know how to consume and store nuts and seeds for fertility health. All nuts and seeds should be consumed in their raw form, or as close to raw as possible, to ensure all nutrients stay intact. Essential fatty acids and zinc are especially sensitive to heat and can be destroyed when heated. Promote ovulation and improve the quality of the uterus by increasing the blood flow to the reproductive organs. It helps to regulate the inflammatory response, thereby aiding fertility issues such as endometriosis, PCOS, and uterine fibroids. It’s important for proper sperm production. In pregnancy, omega-3 EFA can help support proper nervous system and brain development. Zinc works with more than 300 different enzymes in the body to keep it running smoothly. It is important for fertility because it plays an important role in proper development of ova and sperm, hormonal balance, prevention of chromosomal defects, and prevention of recurrent miscarriage. This vitamin is essential to fertility. In fact, the chemical name for the most active form of vitamin alpha-tocopherol comes from the work tokos which means “offspring,” and phero, which means “to bear”. So in order to bear children, you must have adequate levels of vitamin E. Vitamin E is an antioxidant which has been shown to be supportive of nerve cells, red blood cells, the liver and the immune system. Eat nuts and seeds that are organic and raw (see more below if you are sensitive to raw nuts). Purchase nuts still in their shell. Choose raw nut and seed butters or make your own. Grind small fresh seeds like flax, chia, sesame to get the full benefits. That’s because small seeds usually pass through the digestive tract undigested. Sprout raw nuts to help your body to digest them. Make your own nut and seed milks. Purchase nuts & seeds that have been stored in the refrigerated section of the store. This is more common in health foods stores. For longer-term storage, keep in an airtight glass container in the fridge or freezer. Avoid roasted nuts and seeds, especially those roasted in oil. Nuts roasted in oil may be high in free radicals, which damages cellular health. Dry roasted is better, but raw or sprouted is best. 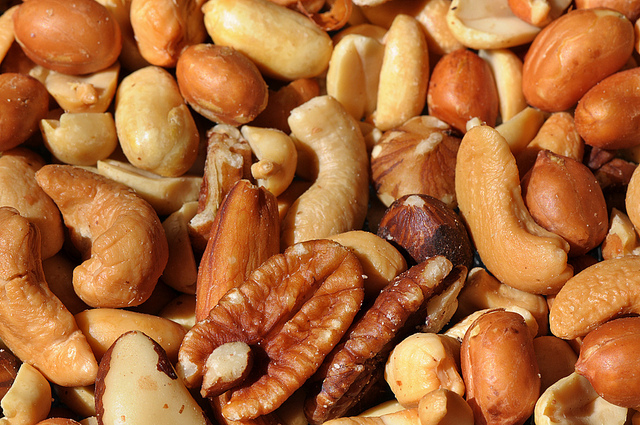 Avoid salted nuts and seeds, unless you lightly salt them right before eating. The salt for soaking in brine water is fine. Avoid purchasing nuts and seeds that have been stored on the shelf. The oils go rancid quite quickly. Avoid roasted nut and seed and butters made from them. Allergies to peanuts are serious. Some studies suggest that when a pregnant woman consumes peanut products, the fetus may be exposed to peanut allergens. This means a developing baby may be at higher risk for developing a peanut allergy later in life. This is especially concerning for parents with peanut allergy. It is suggested that pregnant mothers with a family history of peanut allergy on either side of the baby’s family, should avoid eating peanut products during pregnancy and breastfeeding. This topic is further explored in Step 3 of The 8 Steps to Natural Fertility Your Doctor Doesn’t Know About.